December 2014 – What defines Native Americans? Along with the discussion of defining Native people, there comes outside views from non-native people and what they believe is the culture and identity of Native Americans. A lot of these views and interpretations of American Indian peoples culture and way of life are misleading and destructive. For example, a common stereotype is that all Native American’s have issues with alcohol. Not only is this stereotype untrue but it is a title that I am sure nobody would want especially not an entire race of people. In fact NIAA (National Institute On Alcohol Abuse) did a study and it was determined that whites, especially white males, were more likely to drink and have issues with alcohol than any other race. Despite this, the title of alcoholism still stays with Native Americans. In addition with such accusations is that these ideas don’t just define a singular person or even a group of people but rather puts all Native Americans under such titles. 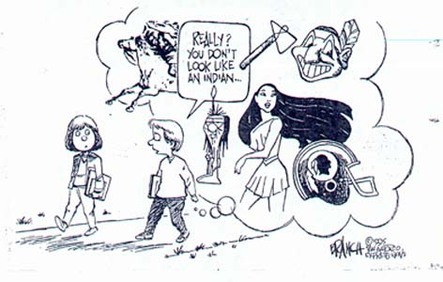 Moreover, that was just one example of the many stereotypes that non-native people use to define Native Americans as a whole. There are several other ideas of Native people, but I thought that alcoholism was the most predominant. I don’t believe that all Native Americans should be defined under such inscriptions but should be looked at in a different way. To try and define American Indians as a whole is illogical because there are just so many different variations of native people with their own traditions, languages, religions and differences that set them apart. I just know that how we are defined by non-native people is not the right way, and if anything we should be characterized by our culture, tradition and so on. There is a common misinterpretation that Native American is an actual definition of an individual that is accepted by Native people. Native American is a box that we check on various applications or forms. The indigenous people of North America were and remain tribal people. There are more than five hundred federally recognized tribes in the United States. Each Tribe has their own language and culture. Although there are commonalities that may exist between Tribes, no two Tribes are exactly the same. For example, I am an enrolled member of the Blackfeet Nation of Montana. I was enrolled in this Tribe prior to the age of 1 year. If you ask for my enrollment information it will state Blackfeet Nation. However, I was born and raised on the Winnebago reservation. I have a Winnebago Indian Name and was brought up in the Winnebago culture. When greeting another Native American I would identify myself as Winnebago. The Blackfeet and Winnebago are very different Tribes in terms of geographical location, language, religion, social organization, social customs, and traditional foods. The classification of simply Native American in no way captures the diversity that exists among the indigenous people of the United States. Furthermore, I generally do not go around introducing myself as Native American. This is how the non-Native American world defines me. So what does it mean to be Native American? I am not sure because my identity is that of Winnebago. My blood quantum would suggest that I am Blackfeet. I guess I am a combination of my blood quantum and identity. My blood quantum doesn’t tell me of my culture. My surroundings and upbringing have formed my identity. What is blood quantum? Blood quantum is a system used in the United States on determining whether a person is Native American. This system uses the Native American blood that someone descends from and bases that off on how much someone’s blood is actually American Indian. For example, someone who’s great grandfather was a full blood Native American procreated with a non-native, then that person’s grandparents would be considered only half Native American. If that same persons grandparents then also created children (the persons parents) with another non-native then those children would only be considered a quarter Native American. If the same thing kept reoccurring, than the later generations blood quantum levels would decrease going to one eighth, one sixteenth and eventually deplete. Of course if someone were to have children with another Native American than the blood quantum levels would increase depending how much the other person is. Altogether, blood quantum is used by the government to define Native Americans. 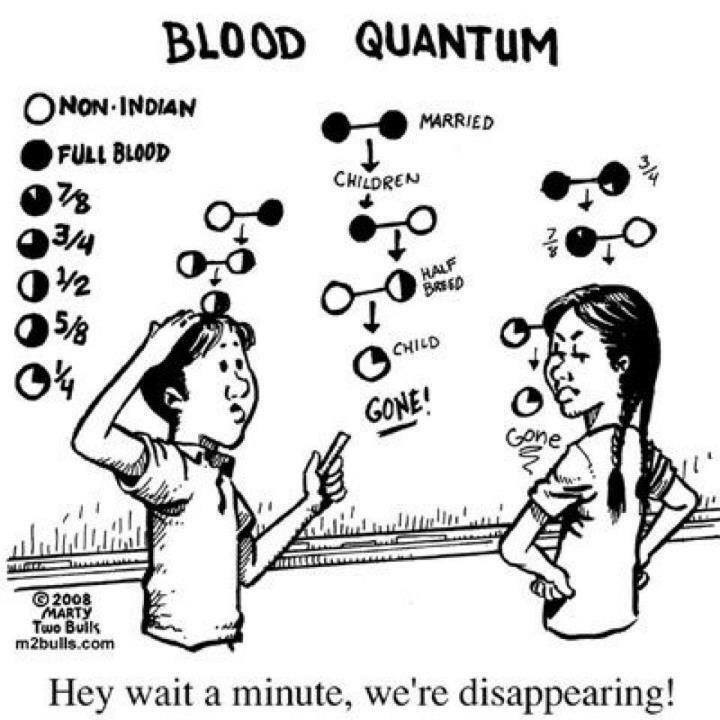 Although blood quantum is a big piece in defining someone as a Native American the question is, is it right and was it created for the betterment of American Indians or is there a hidden agenda behind it? In my eyes I believe that this system was created to help add to the cause of westernizing North America and help getting rid of its current inhabitants. The reason being is because there are only so few federally recognized Native Americans left in today’s society and the likelihood that every single American Indian will reproduce with another American Indian are slim. This means gradually over time, a person will not even be able to be considered as a Native American because their blood will be so diluted due to other races intertwining with it. So blood quantum really does help to extinguish Native Americans. Also, American Indians are the only race in the America’s that have to identify themselves in such manners. No other race needs proof of blood to determine what race they are such as whites, African-Americans, Hispanics. No matter what though, blood quantum is the only way someone can be federally recognized as American Indian. So this is a big part in someone defining themselves as a Native American.